Keeping track of your leads, contacts and other records is crucial. As your business grows, so does your need for a system that not only tracks all your records, but also allows you to further process them. That’s where Flexie CRM comes into play. 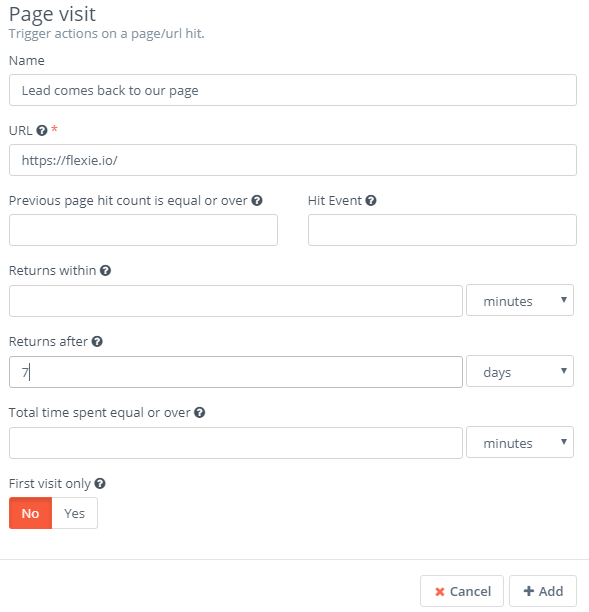 To explain how you can build an action chain for back-on website alert, let’s assume that you have already capture a lead through forms and now you want to execute certain actions upon the lead visiting your page. To be even more specific, you want to execute actions when a lead returns to your website after a week. First, head over to Workflows and then click Manage Workflows. Next, go to the top-right corner of the panel and click New. 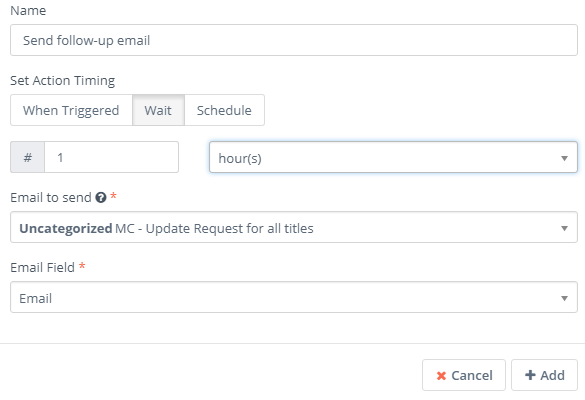 When building a workflow, you have to be specific about what do you want the CRM to do for you. In our case, we want to build a workflow when an existent leads visits comes back to our website after a while, say one week. You need to choose Listener as your workflow source, because you want the system to ‘listen’ for specific events. You want to ‘listen’ for a specific event, lead coming back to our website. To do that, head over to Watch For events and choose Page visit. First, you’re going to give it a name. Next, insert the URL of the page where you’ve placed the tracking pixel. Since you want to execute actions upon the lead coming back to your page after 1 week, you need to set it as 7 days when upon Returns after. Once your fill in the fields, just click Add. Let’s suppose you want to add five points to the lead the comes back to your website. To do that, head over to Actions and select Adjust lead points. Choose 5 as the number of points you want to be added to the lead and click Add. What if you wanted to send a follow-up email? To do that, go to Actions and choose Send email. You don’t want the follow-up email to be sent upon the lead coming back to your website; you want to wait at least 1 hour. To do this, set 1 hour as the timing of the action. Next, choose the email you want to be sent, the email field and then click Add. What if you wanted notify other users about this lead? To do this, go to Actions once again and choose Send web notification(you can also send email and SMS notifications). Set the timing of the action, choose whom do you want to send the web notification to, select the notification title, the notification message and then click Add. Next, go and click Close Builder. Finally, click Save & Close. You’ve just built the workflow. 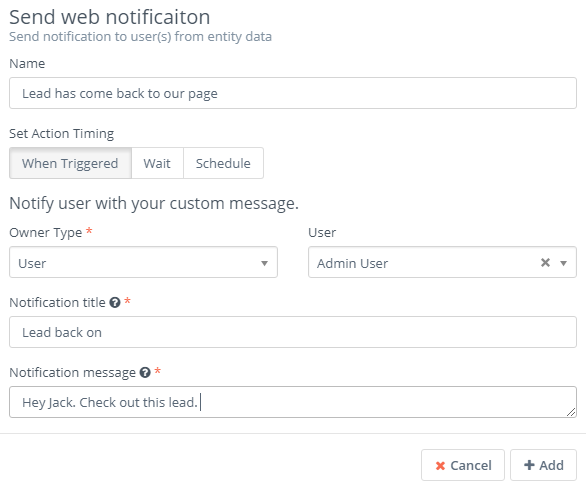 The system ”listens’ for a specific event, if the lead comes back to your page in our case, and then it automatically adds 5 points to the lead, sends a follow-up email(waiting 1 hour) and a web notification to a user or group within the CRM. This is just one of the many concrete scenarios of creating an actions chain for back-on website alert. In Flexie CRM, you can build even more complex workflows, depending on your business needs and requirements.